Lots of companies debate whether or not to host their videos with YouTube as opposed to embedding them on their own site. Their fear is that YouTube will always rank better for the content than their own site will. This fear is warranted as it can be quite difficult to outrank YouTube for the same content. I have come up with a process that should have your website ranking higher than YouTube for the same video. Why Put my Video on YouTube? You might think that the obvious solution to this problem is not to post the video on YouTube in the first place. If you do this, you are eliminating the major competition for your video, but you are also losing the potential for thousands or even millions of views. Because of its popularity and well-optimized structure, YouTube ranks very well for millions of terms. Its domain authority is a perfect 100; it is the Bill Russell of websites. The thing to remember is that you do not have to rank better than YouTube as a whole, just better than a single page. Following this process should have your page ranking higher than the YouTube version. You are competing directly with YouTube so your page must have everything the YouTube page has, and then some. Create a single page on your site dedicated to the video. This page should have at least three sections; the video, related content, and the transcription for the video. The video will need to be hosted, optimized and transcribed. Once the page is complete, be sure it is indexed. You can use the fetch as google tool in google webmaster tools to speed this up, or post a link to the page on Twitter or Google+. After it is indexed, wait a couple of days and then upload the video to YouTube. First you will need to self-host your video or host it with a 3rd party service other than YouTube. I like Vimeo if you need a free or affordable solution. If you are into analytics, then Wistia is your best bet. I will dive more into the details of hosting a bit later in this article. If you are wondering why you should include schema for video on your website, watch this quick video from the Head of Web Spam at Google, Matt Cutts. This will be a quick webmaster video answer. I checked with webmaster trends analysts, and they said, “Yes, please get them to add the markup.” In general, the more markup there is, schema video or whatever, the easier it is for search engines to be able to interpret what really matters on a page. So yes, I would definitely use the schema video markup. Hope that helps. After the video has been embedded on the site, you will want to include the proper schema microdata. Here is an example of a video on the Zion & Zion site that has the proper schema microdata. Search engines cannot watch or hear your videos. For these reasons, a transcription of the video must be placed on the site so the search engines understand what the video is about. YouTube will do this automatically to index the video properly, so it is a must for your site. I like using Speechpad for this. Speechpad is super affordable and quite accurate. As you can see in the example above, the transcription is placed below the video and optimized using schema. This is where you can distance your page from YouTube. This content should be more than just a description—it should be completely different than the description for the video on the hosting provider. The supporting content should relate to the topic of the video and expand upon it. First, you should have a description of the video that you can highlight using schema. For appearance videos, I like to use a behind the scenes section, filled with images and details on how it was shot. If your video is fact-based or telling a story, you can give a background about where it occurred or how you gathered the information. The important thing is the content should be able to stand alone as if there was no video at all. As I said before, you will be uploading your video to two different hosts; YouTube and another of your choice (I recommend Vimeo). Here is the process for uploading your videos so that they are optimized properly. First upload to your preferred host which you will embed onto your site. 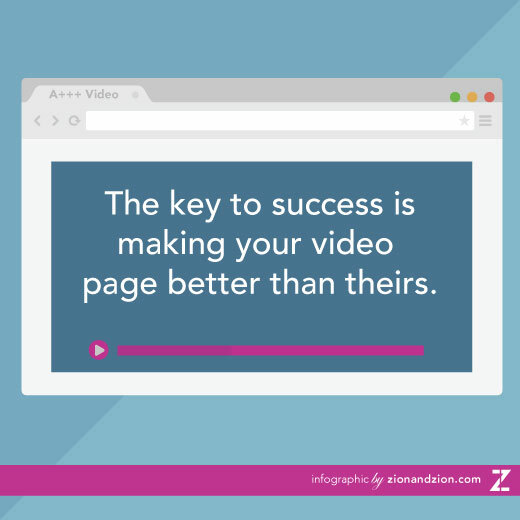 This should be done before your page is live so you can have it initially indexed with the video. After you have the page indexed and appearing in search, wait a few days and then upload it to YouTube. You will be using the same video file for both hosts. Be sure to have the video compressed so it can be viewed full screen in high quality. Most hosts will have compression guidelines for videos. The title for your webpage, embedded host video and YouTube video should all be different. This way they will not cannibalize each other in the rankings. I like to make them very similar using synonyms so my content can rank for a wider range of terms. Your webpage title should be your goal term, the one you want to rank for the most. The YouTube title should be the second most term you want to rank. The supporting content on your webpage should contain a description of the video; this can be highlighted using schema. The description on your webpage, embedded host, and YouTube should all be different yet similar. Much like the titles, you will want to use synonyms so you can rank for a wider range of terms. In host descriptions, the first line should contain a link to the page on your website. This will help search engines associate the video with your page and add two links to your link profile. I like to turn off commenting on my videos so that the user generated content doesn’t help the hosting pages outrank my website’s page. If one of your goals is to have the video rank well on YouTube’s search, leave commenting turned on for that host. If you follow these steps, your webpage should rank higher than YouTube for the same video. If you are really lucky, you can earn the top three spots in the SERPs (Search Engine Results Page) with your webpage, YouTube video, and your embedded host video. If you have any questions, feel free to reach out to me on Twitter.